Durable Sealcoat is a residential driveway sealing application service in Meriden CT specializing in sealcoating asphalt driveways. New England is known for its diverse weather conditions throughout the year and since Meriden CT is located in the center of the state it gets coastal and inland weather damage. By protecting your driveway from the elements with proper sealcoating you can avoid costly repairs down the road. Plowing or shoveling in the Winter months can take a toll on a driveway and our team of sealcoating professionals in Meriden CT can help you prepare for those months before it is too late. Treating, cleaning, repairing and brushing in the preparation stage is the most important part of our process. Our work speaks for itself and our attention to detail is what separates us from those companies who don’t meet the standards of a properly sealed driveway. Oxidation and deterioration can occur if a professional does not seal your driveway. 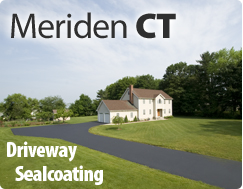 Seal coating your driveway in Meriden CT increases the curb appeal and decreases the need for repair or replacement. Spending time with your family and friends is more important than trying to seal a driveway yourself. It takes years of experience to do it right and learning how to do it in an afternoon usually leads to having to hire a professional anyway. Why waste time and money on something you will probably never do again anyway? Durable Sealcoat can tackle any driveway sealcoating project and has repaired, fixed and enhanced hundreds driveways in Meriden CT. We are a family owned company and there is nothing more important than your family. That is why we are passionate about keeping driveways safe to play or work on by repairing damage that could lead to a slip or fall by a family member, neighbor or visitor. 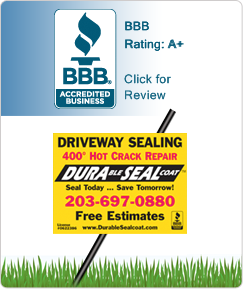 Durable Sealcoat can inspect your driveway in Meriden CT and provide you with an estimate on how long it will take, how much it would cost and when you can start to use it again. 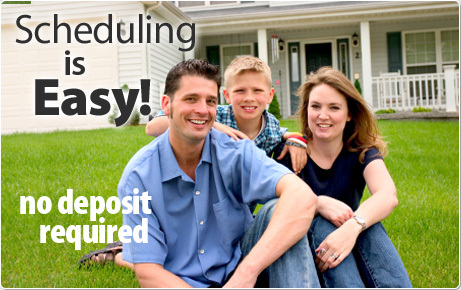 So call or click today to receive a driveway sealcoating estimate for your home.